India Carbon Outlook organized Parivartan Sustainability Forum 2011 where leading experts shared their views and opinions on corporate sustainability in India. 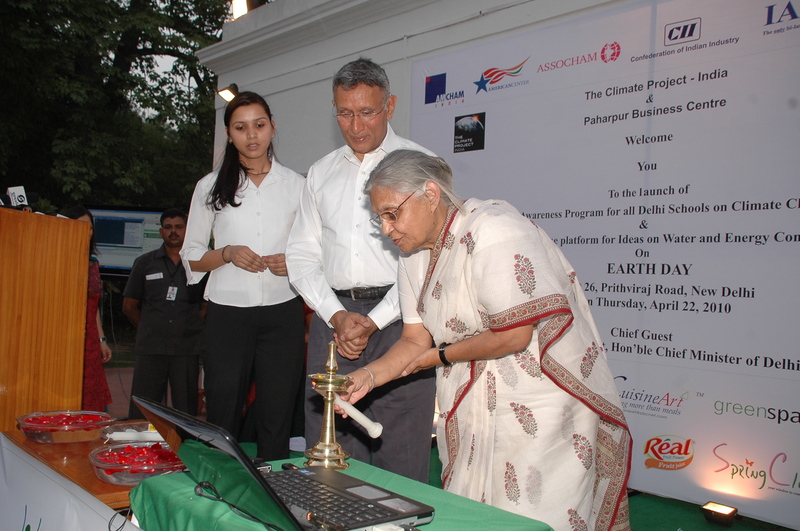 Mrs. Sheila Dikshit, Chief Minister of Delhi, inaugurated an Awareness program on Climate Change for Delhi’s School Students and a web platform – GreenSpaces Ideas on Earth Day, Thursday, 22 April’2010 at 26, Prithiviraj Road, New Delhi-110011. The awareness program for Delhi Schools launched by The Climate Project-India and supported by Paharpur Business Centre & others, aims to make all school children in Delhi aware about the challenge of climate change and its impacts by training teachers in every school before the Commonwealth Games, 2010. Anushka Pinto, Country Manager, TCPI remarked “We will conduct workshops for teachers and provide them with material specially designed to use in their classroom. We will also provide teachers with ongoing content and technical support”. With over 2000 schools to cover, this initiative calls for individuals and corporates to volunteer their time to mentor the teachers being trained. Support can also be extended in the form of sponsorship, donation and advertisements. “Delhi is the greenest capitals in the world and we are trying to inculcate good clean habits among kids. We are looking forward to a clean and green Commonwealth Games” the Chief Minister said. GreenSpaces Ideas, launched by Paharpur Business Centre, is an online platform to post green ideas. Mrs. Sheila Dikshit posted her idea – “reduce, reuse and recycle” and inaugurated the initiative. The Government of Delhi, AMCHAM, American Center, ASSOCHAM, CII, Indo – American Chamber of Commerce and Indo – German Chamber of Commerce are partnering for this program. The Climate Project India (TCPI) founded in March 2008 with training conducted for civic and business leaders by Nobel Laureate Al Gore and Dr. R.K. Pachauri. These trained leaders form the core of the project’s volunteer based organization which now spans six countries and over 2,500 climate leaders. Its mission is to raise awareness on man-made Climate Change and to help India respond. Since its inception in India, TCP Leaders have made presentations to various corporates, politicians, universities, clubs, schools, RWAs and to interested parties who understand the need for urgent action on Climate Change. These committed volunteers have conducted over a thousand presentations and workshops. Mr. Kamal Meattle, Trustee, TCPI & CEO- Paharpur Business Centre & Software Technology Incubator Park (PBCTM – STIP) & GreenSpaces has been a keen environmental activist, he has taken up various social and environmental issues, creating public awareness as well as advocating policy change. He remarked “We need to act and make ‘Green Living’ a way of life. We need to organize huge grassroots awareness in our City and in our country over what is happening to our environment and do something about it, and not simply talk about it”. PBC expects to be the first USGBC LEED (EB) Platinum certified – a retrofit building and its new project – GreenSpaces™ is being built as the World’s most energy efficient commercial building. This assumes great importance given the fact that buildings use 40% of the world’s energy and that the world’s energy demand is expected to increase by 30% in the next decade. 60% of the World inhabitants will be living in cities with a population of over 1 million by 2024. Sponsors for the Earth Day event were Bisleri, ConferenceSpa, Clausthaler, CuisineArt, GreenSpaces, IBM, Max Healthcare, Nestle, Pepsi, Dabur, SpringClean and Taj Mahal Hotel. Don’t smack your fingers, just love it.